Trombone’s are an essential band and orchestra instrument. And so, you need to choose one of the best trombones in order to get the most out of the instrument. This versatile instrument did not enter the orchestra hall until 1808 with Beethoven’s 5th symphony. But, slide brass instruments have been around since the middle ages and before. Today, you will find trombones in orchestral, band, and jazz ensembles. The come in a variety of shapes and sizes. Plus, trombones are manufactured by a variety of brands. 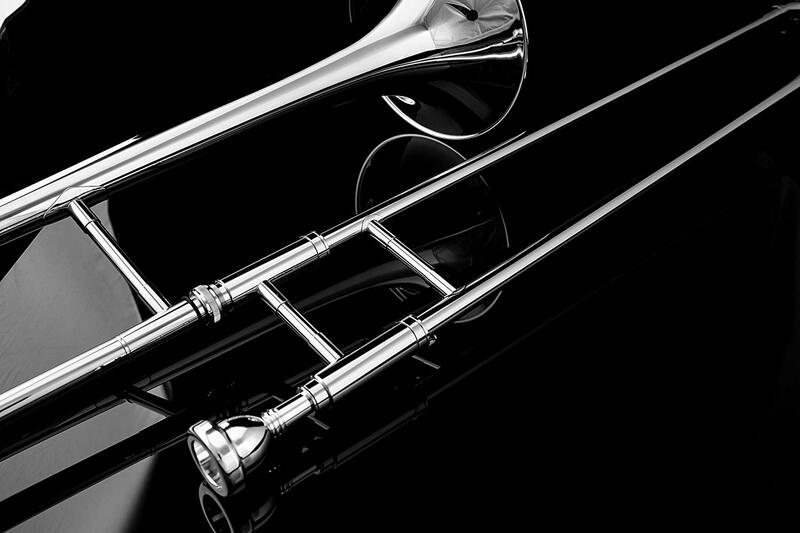 So, read on if you want to learn more about the trombone and how to choose a great one for the musician in your life. Features: B-flat/F key, .547-inch bore, 8.5-inch bell, and fixed leadpipe. Vincent Bach is a brass manufacturer that produces trumpets, trombones, flugelhorns, cornets, and mouthpieces. The company was founded by Vincent Bach in 1918. Initially, Bach only produced mouthpieces. But, in 1924, the first Bach trumpet was sold. 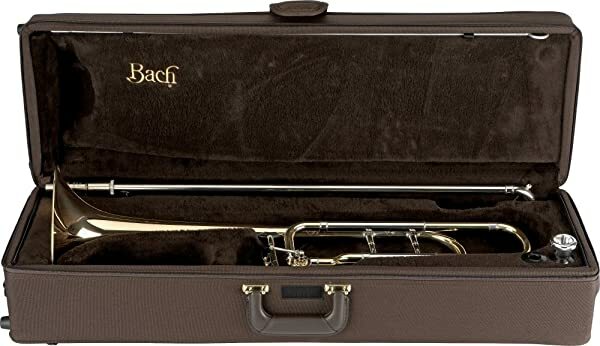 Since that time, Bach has made a name for itself as a producer of the highest-quality brass instruments. Read this article if you want to learn more about Bach trumpets. Bach’s 42BO Stradivarius Series trombone illustrates what makes the company so special. It is a large, yellow brass instrument. The 42BO comes with an 8.5-inch bell and .547-inch bore with a fixed leadpipe. It is playable right out of the box, so you will not have to set up the instrument at all. In fact, there is very little not to like about the Bach 42BO trombone. Can be played right out of the box. Rich and deep sound with any adjustment needed. Great for beginner and intermediate players. The grease provided is not the highest quality. A large instrument that may be too heavy for some players. Features: B-flat key, .500-inch bore, 8-inch bell, and one-year warranty. Cecilio is an instrument manufacturer that specializes in strings, woodwinds, brass, and instrument accessories. Mendini by Cecilio makes drum sets too. The company has been around for the last decade. All of their instruments are hand-crafted. Additionally, they specialize in student instruments of all kinds. That’s not all . 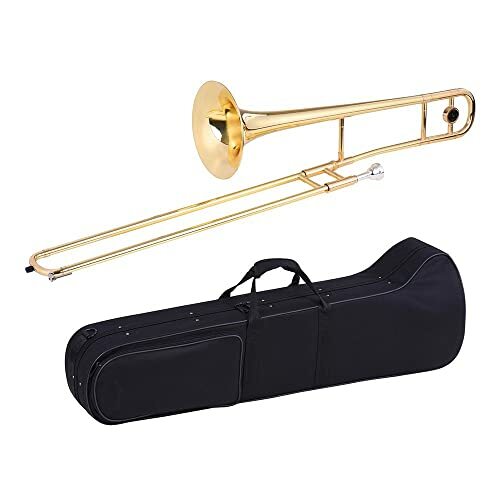 . .
Mendini by Cecilio’s B-flat gold lacquered trombone is perfect for the beginner player. It is a medium sized instrument. So, it is not too heavy for a smaller player. Plus, it comes with a cleaning cloth, slide oil, and white gloves. Essentially, everything you need to get started as a trombone player. If you have an aspiring trombonist in your life, you need the Mendini by Cecilio B-flat trombone. A medium, easy to use instrument. One-year warranty protects your purchase. Comes with a number of great accessories. Included tuner helps teach intonation. No F-attachment included, so it only plays in B-flat. Gold lacquer can be scratched off. Features: B-flat key, .547-inch bore, 8 11/16-inch bell, and fixed leadpipe. Yamaha is one of the best-known instrument manufacturers in the world. There is an important reason for their reputation. They produce great instrument. Even so, you may expect that because Yamaha creates everything from pianos to strings to brass instruments, they may struggle to keep everything the same quality. But, you would be wrong. Keep reading . 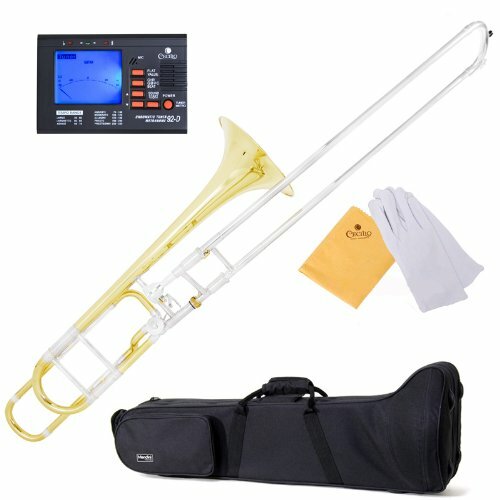 . .
Yamaha’s YSL-8820 Xeno Series trombone is a huge improvement from beginner-level trombones. This instrument is designed for intermediate to advanced players. So, it comes with a F-attachment, which expands its range. Plus, it is large with a .547-inch bore and 8 11/16-inch bell. Therefore, if you are a larger person, this is the trombone to purchase. It even has a great sound to match its beautiful yellow brass construction. Can be a B-flat and F trombone. Yellow brass construction is durable. Comes with the standard features you expect on a high-quality, intermediate/advanced instrument. Sound is smooth with no twangs. Using the F-attachment can be complicated for a beginner. Features: B-flat/F key, .547-inch bore, 8.5-inch bell, and one-year warranty. You may recognize Mendini’s name from our number two pick for the best trombone. Mendini and Cecilio are related instrument manufacturing companies. And, Mendini produces a wide variety of instruments, including strings, woodwinds, brass, and accessories. Plus, they claim to offer these products at wholesale prices. So, you know that Mendini’s student instruments are a good deal. 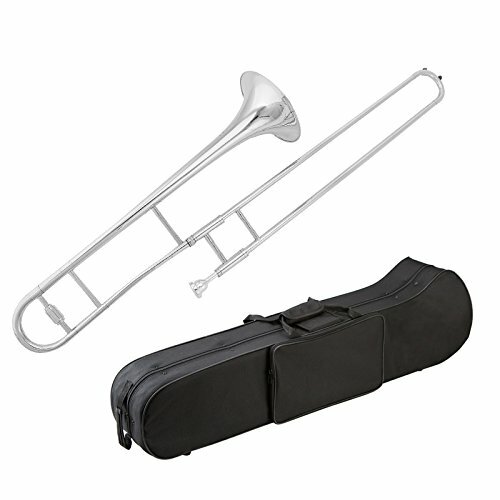 Mendini’s MTB-31 B-flat tenor trombone is designed for intermediate student plays. Still, it comes with a variety of accessories that make playing easily. These include a tuner, durable hard case, white gloves, and cleaning cloth. Additionally, the MTB-31 is a large trombone with a smooth slide action. One drawback, some people may not enjoy the white and yellow design of the instrument. Comes with a F-attachment for an expanded range. Accessories included to make this instrument playable right out of the box. Mendini provides a one-year manufacturer’s warranty. Great sound for the material. Some may not like the nickel-plated design. Not as good a sound as some of the higher-end models. Conn-Selmer is the parent company of a number of instrument brands. These include Vincent Bach, C.G. Conn, King, Holton, Selmer, and more. We have already discussed a Vincent Bach trombone in these reviews. However, the 88H Symphony Series is a C. G. Conn instrument. Conn-Selmer is itself a subsidiary of the famous Steinway Musical Instruments, Inc.
Conn’s 88H Symphony Series trombone has all of the experience that the brand’s over hundred-year history behind it. So, it is not surprising that this is a great, intermediate to advanced trombone. It comes with a F-attachment to increase your range. Plus, it has a large 8.5-iunch bell and .547-inch bore with a fixed leadpipe. There are no major accessories included with the 88H, but it is still a great-sounding instrument. Comes with an F-attachment, which expands the range. Uses durable and traditional yellow brass. The primary bore is .547-inches. However, the F-attachment bore is .562-inches, which adds versatility. Light enough for most players. Yellow and bare metal design my not appeal to all. Not a good instrument for beginners. Features: B-flat key and .500-inch bore. 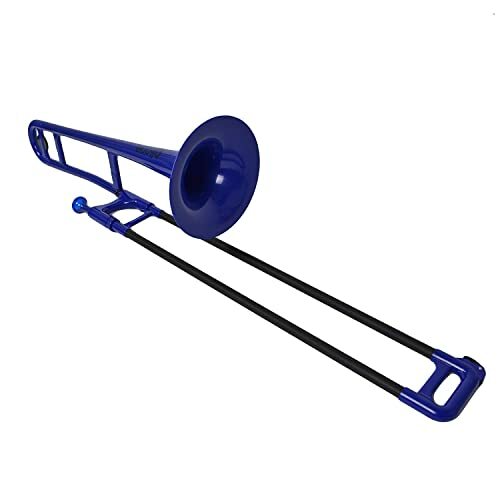 If you want an unusual trombone, then the pBone PBONE1B is the instrument for you. The company, Warwick Music Group, has been around since 1994. They introduced the world’s first, and best-selling plastic trombone. And, in 2018 they also created the pCornet and pTrumpet, the world’s first plastic cornet and trumpet. But, that’s not all . . . The PBONE1B is a great instrument on its own. It does not sound like a brass trombone. But, it likely has a better sound than you would expect with plastic. And, you can not beat the affordability. 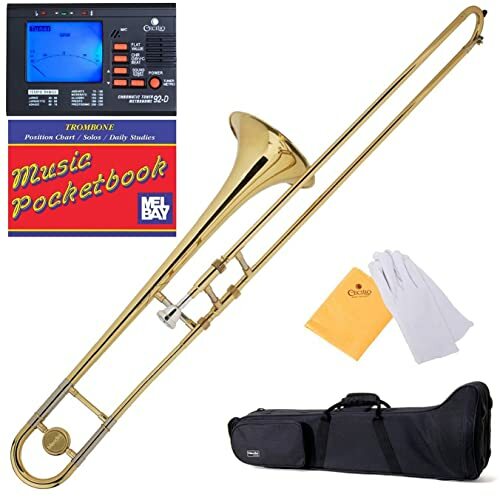 pBone includes a number of accessories and perks to their products that will increase your trombone skills and knowledge. 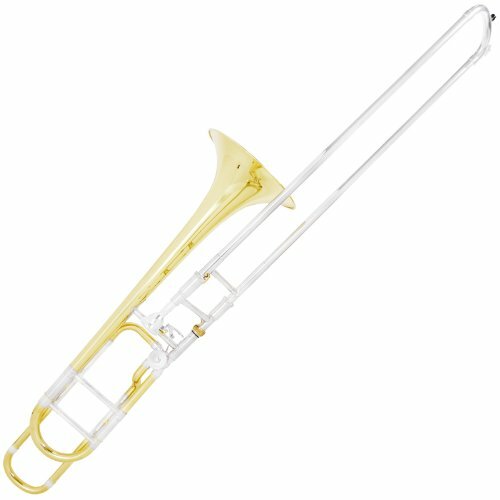 Use of plastic makes the PBONE1B extremely affordable. Lockable slide has glass-fiber to create a smooth action. Receive a 6-month free membership to the International Trombone Association and free online lesson with your purchase. Comes in eight different colors. Plastic mouthpiece does not respond as well as metal. Sound is not as good as the brass trombones. Glory makes a number of woodwind and brass instruments. They specialize in selling instruments online. But, that does not mean that their quality isn’t of the highest standards. For beginner players, it does not get much better than Glory instruments. The Glory Brass Bb Trombone is easy to play and light enough for the smallest player. Plus, it comes with a durable hard case for easy carrying. It is only a B-flat trombone. However, the lack of F-attachment is perfect for the beginning student. So, if you need a pared-down and simple trombone, this is the one for you. Comes with a deluxe and durable hard case. Decent sound for a beginner instrument. Gold lacquer can scratch off easily. Does not have many listed features. Features: B-flat key and 208mm bell. Ammoon is a new manufacturer of instruments for students, teachers, and hobbyists. You will find a variety of products on their website. These include band and orchestra instruments, drums, keyboards, Pro audio equipment, and strings and gear. Essentially, anything to do with musical instruments that you need, you can get from ammoon. Ammoon’s Tenor Trombone in B-flat uses high-quality metals (brass and cupronickel) to increase its durability. Plus, it comes with everything you need to get started playing. And, it is not very heavy, which is perfect for younger players. This is a great all-around trombone for anyone. Materials used include high-grade brass and cupronickel. Great for players of any level. Slide works smoothly and easily. Also, comes with gloves to help keep the instrument clean. 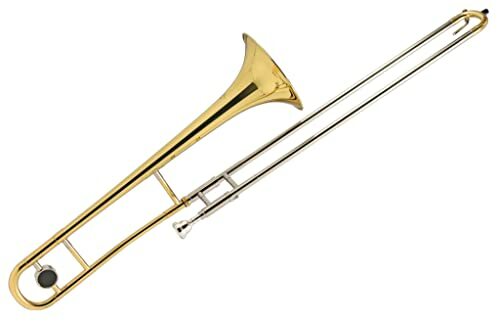 Some trombones are differently colored than the pictured product. Features: B-flat key, .500-inch bore, 8-inch bell, and 45-day free trial. Kaizer is a manufacturer of student instrument. They are a completely American company and have American standards and ethics. So, you know you are getting what is advertised with a Kaizer instrument. The company creates woodwind and brass instruments that are sold throughout the country. Kaizer’s trombone in B-flat is handcrafted for perfection. It comes with everything you would want in a student instrument. From its 45-day free trial to large number of accessories, Kaizer has the student in mind. Plus, the B-flat trombone is of medium size with easy-to-use parts. You won’t get a better sound or function form another student trombone. Set up to be easy to use for students. Plus, you get a lifetime no-hassle warranty. Comes with all of the accessories you need to get started. Designed for students, so is not a great instrument for advanced players. Slide is not as smooth as you would want. Features: B-flat key, .481/.491-inch bore, and 7 3/8-inch bell. King is another Conn-Selmer brand. It was first began in 1894 by Thomas King, who was a trombonist. So, you know that the company understands how to make a great brass instrument. And, King also produces trumpets, tubas, sousaphone, and marching brass. King’s 2102 2B Legend Series Trombone is the only jazz-specific trombone on our list. It is smaller. But, it has a great upper range of pitches. And, it is known for its clear projection. While this trombone may not be perfect for students or marching band players, it is good enough to try out today. Designed with jazz musicians in mind. Great, gravelly sound and clear projection. Smallish instrument that is easy to handle. Has a classic and timeless look. Great upper range, which is unusual for a trombone. May be too small for some ensembles. 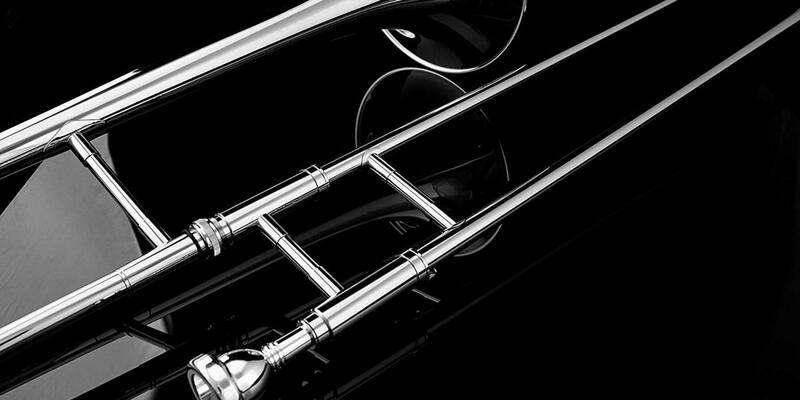 There are quite a few factors to consider when purchasing a trombone. The ones we list below are the most crucial to a great instrument purchase. All of the trombones in this review are tenor trombones. This is the most common type of trombone for ensembles. And, it has a key of B-flat. However, the key severely limits the number of notes you are able to play on the tenor trombone. So, some products include a F-attachment that expands the range on the low end. There are two types of F-attachments: standard wrap or open wrap. For the intermediate trombones listed here, the standard wrap is the most common. However, it increases the amount of resistance on your slide. So, make sure to research F-attachments and their pros and cons before purchasing a trombone with this feature. Traditionally, trombones were made from brass. Hence it being a part of the brass family of instruments. However, today trombones come in a variety of materials. Metals are still the most common. But, you will even find plastic trombones on the market. Also, there are a number of different types of finishes to choose from. You will find lacquer finishes most often. Yet, plated finishes can be found as well. They type of plating used in plated finishes significantly changes the look of the trombone. For the most part, the material and finish of your trombone is a cosmetic consideration. Finishes, especially, do not have a huge bearing on the sound of the trombone. Yet, most people believe that metal trombones sound better than plastic ones. The material and finish you choose will depend on your personal preferences. As with all instruments, trombones run the gamut from affordable to expensive. So, always bear in mind your budget when you are purchasing a new trombone. 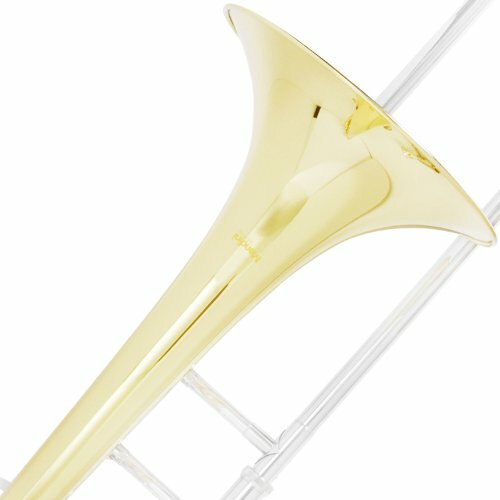 In general, beginner trombones will be less expensive then the instruments designed for intermediate or advanced students. If you are new to trombone playing, we recommend starting with a more affordable option and working your way up. Thus, you will not waste money on an instrument that you may not enjoy playing. However, if you are looking to start a career as a professional trombonist, then you should invest in a more expensive instrument. Even though all of the trombones listed in this review are tenor trombones, they still come in different sizes. You will notice that the bore and bell measurements are different for some of the instruments. Plus, the weights of each trombone vary wildly. Weight is determined by the materials used to make the trombone. The size of the trombone you need depends on your size and strength and the type of playing you will be doing. Orchestra trombones have a different size than marching band trombones. And, jazz models are significantly different than orchestra or band trombones. So, make sure that you are following your specific ensembles’ requirements as you choose your instrument. Trombones are a great instrument. There is no other instrument in the brass section of an ensemble with the trombone’s depth or soul. 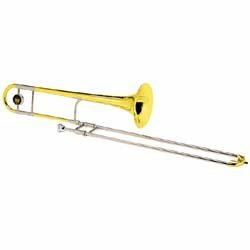 But, in order to bring out that unique sound, you need one of the best trombones available. This article has provided a list of the ten best trombones. Additionally, we have offered a buyer’s guide to help you narrow down your choices. Also, we highly recommend trying multiple instruments before you buy. This way you will know what features are important to you and what you can let slide. Go ahead, try a trombone today, and see what all the fuss is about.